I am going to be bringing my son to the Arnold (as in Schwarzenegger) athletic games in Columbus, Ohio on Saturday to compete in fencing. The games are sponsored by Governor Schwarzenegger, and have been for years. The convention center in Columbus becomes filled with just about every indoor sport competition imaginable, such as fencing, gymnastics, weightlifting, martial arts etc. Each year Mr. Schwarzenegger himself shows up and stops into the finals of every sport. It was actually quite funny last year because, as a governor, he has bodyguards for protection. So, naturally, all competitors in fencing were told that the governor's visit to the fencing match would be pre-announced by about 10 minutes and that all matches would stop and that all foils, epees etc had to be placed on the ground and not remain in anyone's hand. 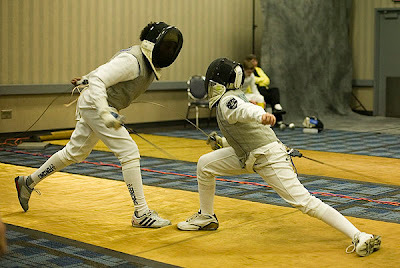 I have previously mentioned that my son is quite a good competitive fencer in foil. As a matter of fact, he won the gold medal at "The Arnold" last year....but as you age the competition gets stiffer and more difficult. 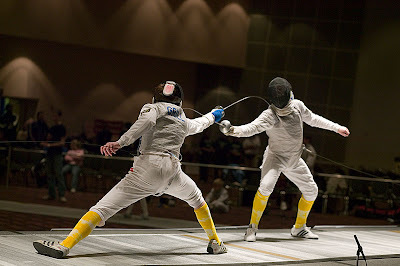 Sports photography is not something that I really "do", but I did give it a whirl at the fencing tournament last year. So here we have two action shots from the finals (my son is the one on the left in both shots). And, yeah, I will also throw in a shot of Arnold. 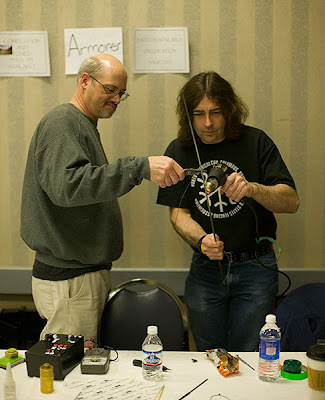 The armorers work at fixing a foil that has malfunctioned. 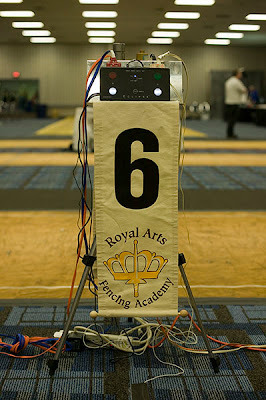 Scoring is done with a combination of electronics and referees. As I mentioned in yesterday's post, since I am away for the weekend at a fencing tournament with one of my sons, I thought that I would post some of the images I have been taking at the tournament in order to give people a bit of a 'flavor' of what it is like to be at an event of this sort. Every tournament has an armorer present. His or her job is twofold. 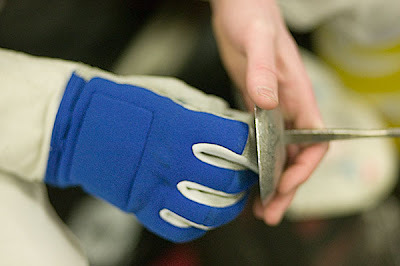 First, they test and authorize each piece of equipment used in the tournament to ensure that they pass very rigorous safety standards. Second, they are on site to assist in the repair of equipment that breaks or malfunctions during the bouts. 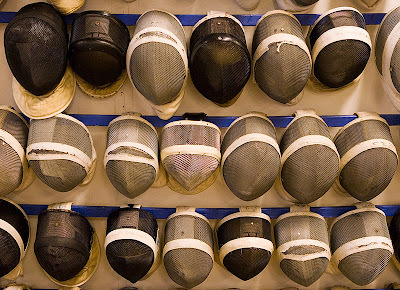 Competitions consist of all the contestants being divided into pools of 5-7 fencers with the pools being balanced in fencer ability based on national rankings. 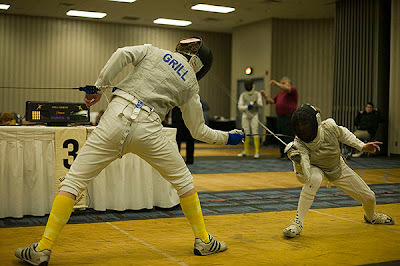 The fencers in each pool all have a turn to fence a 5 point, or touch, match with each other fencer in the pool. The fencers are then ranked based on their performance in the pools (number of wins and losses, how many points they have scored, how many points have been scored against them) and then they advance to the 15 point direct elimination bouts. During these bouts the top ranked fencer of the day faces the bottom ranked fencer, the second best faces the second from the bottom, and so on. Ultimately, the top performing fencers face each other for first, second and third place. A few more shots tomorrow, though I will be spending most of the day driving home. Then back to some more philosophical thoughts on Monday! One of my son’s is a competitive fencer. Yup, that’s right….Zorro, The Three Musketeers, you got it. I knew absolutely nothing about the sport before he decided he wanted to take it up four or five years ago. At this point, he really has become quite good at it; good enough to compete on a national level. 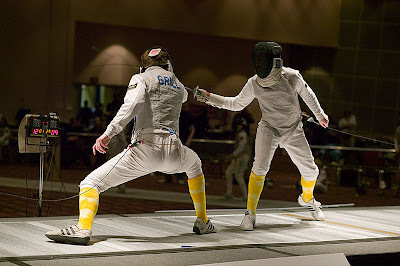 Now, generally speaking, I really am not much of a sports person (though, living in Pittsburgh, I do love those Steeler games), but, I have to say, I find fencing fascinating, graceful, and exciting. There is a good reason that the sport has been nicknamed ‘physical chess’. Because it is such an eclectic sport, at least in the USA (I understand it is much more popular and mainstream in Europe), there is a rather interesting subculture surrounding it. When I go to some of the competitions, I bring my camera. However, I am generally not looking for action shots (and besides, the lighting for such shots tends to be pretty poor). I tend to go for the abstracts and the intentional motion blurs. I also like to use a photojournalistic approach to try and capture the ‘flavor’ of what it is like to be at a fencing competition. At any rate, this coming weekend I am taking my son to The Arnold Fencing Classic in Columbus, Ohio, organized by none other than The Arnold (Schwarzenegger). It actually is more like a yearly fun meet than an intense competition, but I am going to take a camera. My thought is that there are probably relatively few folks out there that are familiar with such competitions and that it might be interesting to post some of the images to try and convey what it is like. Thus far I have managed to post to the blog on a daily basis and plan to continue over this weekend as well, hopefully with some fencing images. There are, of course, probably still some hotels around that don’t provide internet connectivity….I am assuming that the one that I will be in won’t be part of that ‘elite’ group, but I guess one can never be sure!